Do you prefer Mainline Sonic to run on Internal or External logic? I still say this shift between internal and external logic is essentially just made up as an excuse to feel objective or correct about not liking something, but there is absolutely one character who prescribes to character roles and archetypes more than their own 'character logic' or internal drive, and it just so happens it's also the most popular one. Penguin God wrote: Eggman's not really much of a main villain when he's using Shadow's plan to use Shadow's satellite to fire Shadow's laser at the moon. Erm… Shadow doesn't own Space Colony ARK; in fact, if any one person could be said to 'own' it (given it's a government research station), it's Gerald Robotnik. Not to mention Shadow's plan is actually Gerald's plan. I wouldn't say that Eggman's always been beloved by the entire fandom. There are plenty of people who dislike him due to his weakness as a villain and a character, as well as the fact that his intellect, pretty much his defining ability, being a major informed attribute rather than something he's regularly demonstrated. ToaArcan wrote: There are plenty of people who dislike him due to his weakness as a villain and a character, as well as the fact that his intellect, pretty much his defining ability, being a major informed attribute rather than something he's regularly demonstrated. I wouldn't put much stock in IQ; all a high IQ means is you're good at IQ tests. Plus the guy did design and build a huge freaking space station. A space station that he then tried to launch without the Chaos Emeralds he supposedly needed to power it, and the thing began to fall out of the sky the moment a couple random robots got blown up. And then he tried to launch it without the Emeralds again and it crashed yet again. And then he actually got a power source, but put that in a mech instead, and this time the station just straight up exploded when the robot did. The Death Egg was not a very good space station. And considering his admiration for Gerald, he probably just copied ol' grandpa's designs for the ARK. ToaArcan wrote: The Death Egg was not a very good space station. And considering his admiration for Gerald, he probably just copied ol' grandpa's designs for the ARK. The Death Egg was built before Ivo learned of Gerald and ARK though; he wouldn't have had the ARK blueprints to base anything on. I'd disagree there: SA2 establishes that Eggman was inspired by Gerald from the get-go, and there's no way the ARK wouldn't have been noticed. ToaArcan wrote: there's no way the ARK wouldn't have been noticed. Unless the only info about it was locked away in government files, like the info on Project Shadow was. Amateur astronomers would notice the ARK pretty easily. The International Space Station is visible from Earth with the naked eye. The ARK is even bigger than that, by the looks of it next to the shuttle. It would look like a second moon. For the effects of the story, it's Shadow introducing the ARK, Shadow introducing the plan, Shadow commanding things. Eggman's just along for the ride for most of the time. We do have to keep in mind that Shadow did all this, under Eggman's command. It was Shadow after all who went all genie mode and said he'll grant Eggman, which was the set up for the whole shabang-a-bang. At best, Shadow was acting as the guide for Eggman, though we clearly see Eggman giving the orders when when it came to him, Shadow, and Rouge, taking care of business at G.U.N. 's base. It is true that Shadow used Eggman for his own goals, Eggman commanded it in the first place. About Eggman being a beloved character or not, while I've seen no real hate for him, honestly, at least in the games, I've seen no real reason to like him after roughly after Adventure 2, especially in Sonic X and Unleashed. He started becoming the punch line for comedy rather then the evil villain he's suppose to be, but this is interpretation of according to Japanese content, where he started just putting animals in robots and only started making giant space stations and killer robots after he he wanted to take out Sonic. This is a big contrast to Robotnik in Satam(continued in the archie comics), Underground, and Fleetway, where he was a real big bad. The first 3 of the former had him taking thins over before Sonic had the chance to stop him, and it took a long time before he could, Underground didn't finish it's story however. The latter, Fleetway, started like the games, but made Robotnik a lot more evil and competent, to the point where he built a robot that Sonic never defeated, and when that robot rebelled and amassed his own army against everyone, it was Robotnik himself who destroyed him, with liquid nitrogen and his own fist. While he was driven crazy in later in that series, and still is or comatose at this point, Fleetway Robotnik may have been one of the baddest Robotniks out there. As usual, you're the smartest person in any given thread you post in. This is basically it. "Internal logic" as the baseline requirement for something being "good" and "objective" is incredibly silly when, as the thread's demonstrated, you don't actually have to have the characters you've followed be the ones with actual arcs, or who relate on a thematic or emotional level to the story. As long as there's "internal logic", character's just have to be there and be present. The story doesn't actually have to be ABOUT anyone, or anything. Sonic writing reached its apex when all the writing was suddenly sophisticated, ambitious, dramatic...and nothing about it actually related to him or his friends. Between someone earlier in the thread saying liking internal logic over external gave him "higher standards" while admitting the context of those internal logics didn't actually matter, and me just now seeing that someone literally thought that it didn't actually matter that the dramatic stories he said were superior to current comedy were stories that had literally NOTHING to do with the grand dramatic ideas and stakes proposed by the story. All of the arguments for internal logic, an argument that insists the necessity of context and grounding, are constantly argued from an anti-context perspective. To the point that when confronted with the fact that "internal logic" has never adhered to the sort of higher contextual logic most good drama actually does, the conversation just got reset with him explaining the difference between internal and external, as if that was ever in question. Everyone in this thread who supports "internal" as somehow being objectively better seems to crumble under even the slightest requirement of abstract thought. That's my question to "internal logic" people: what if "characters have motivation" isn't the highest standard I hold something to? Are you actually able to argue that the core Sonic characters, the characters the series were actually about before the writing took the turns it did in the height of the series's "internal logic", all live up to exploring the themes and ideas the games all propose their stories to be about? Or is the only argument you have is that how well someone actually fulfills their narrative ambitions doesn't matter, just as long as Sonic doesn't quip as certain times about the high prices of chili dogs? The way the thread goes, the internal logic crowd seems less about a quality of standard and more about dismissing any sort of genuine, critical level of thought, praising incredibly dry, literal thinking. It's not a group of people trying to achieve a greater level of quality in an art piece they really enjoy, it's wanting to create something that doesn't frustrate their hyper-literal brains. Once you break into talking about core themes, emotional continuity, or the wider ideological context that events either do or do not adhere to, they legitimately have no response. faceclams wrote: Amateur astronomers would notice the ARK pretty easily. True, but they wouldn't necessarily know what it is; all they'd see is a big metal ball (IIRC, one hemisphere is just a cover for the Eclipse Cannon). Mordum wrote: That's my question to "internal logic" people: what if "characters have motivation" isn't the highest standard I hold something to? Are you actually able to argue that the core Sonic characters, the characters the series were actually about before the writing took the turns it did in the height of the series's "internal logic", all live up to exploring the themes and ideas the games all propose their stories to be about? Or is the only argument you have is that how well someone actually fulfills their narrative ambitions doesn't matter, just as long as Sonic doesn't quip as certain times about the high prices of chili dogs? IMO the Adventure series theme is people are fundamentally good. The new villains introduced in this series (Chaos, Gerald and Shadow) are motivated by grief and vengeance not simple cruelty and while there are boss battles against them, they are only stopped by opening their closed hearts(Sonic and bunch of chao for Chaos and Amy for Shadow, which also stops Gerald) Dr. Ivo Robotnik is implied that the reason he wanted to conquer the world was to avenge his beloved grandpa. (Aslo notice that the Death Egg resembles the Ark) Even G.U.N who are the reason most of plot happens in SA2 isn't a stereotypical evil government organization and was trying to protect people. This is also backed up with the characters Gamma and Rouge who give up their evil, or greedy in Rouge's case, actions through Amy and Knuckles influence. Sonic: Has no other ambitions other than having a adventure, gets this while saving people. Tails: Wants to get out of Sonic's shadow, accomplishes this in SA1 and acts independent of Sonic in SA2. 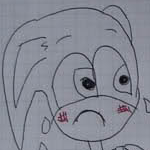 Amy: Is sick of her boring life in SA1, after attempting to rescue a flicky her life gets more exciting. Knuckles: Wants to protect the Master Emerald and does this the best he can. Location: Somewhere fighting the Eggman Empire for the United Federation.